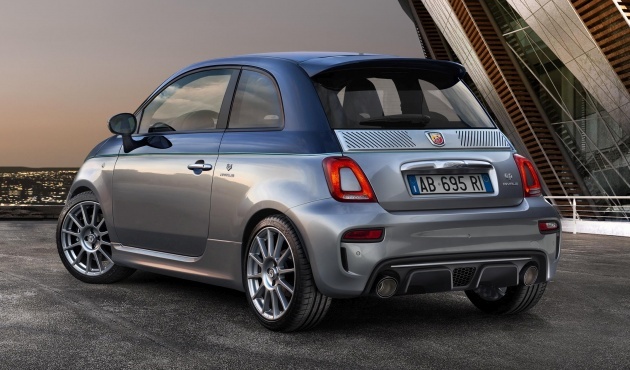 Sitting on 17-inch Supersport alloy wheels with a special glossy grey finish, the variant is also decked out with Brembo brakes – with black four-piston fixed calipers in front – and an Abarth by Koni suspension system with frequency-selective damping. Also on, an Akrapovi? exhaust with carbon tailpipes. Like the various 695 editions of the past (the 695 Fuori Serie, 695 Tributo Ferrari and 695 Maserati), the Rivale variant is equipped with a 1.4 litre turbocharged T-Jet mill offers 180 hp and 250 Nm. Performance figures include a 0-100 km/h time of 6.7 seconds (6.9 seconds with a robotised sequential transmission) and a 225 km/h top speed. Available as hatchback or convertible, every 695 Rivale will come complete with a numbered plaque, mounted using the same screws that Riva employs on the Rivale 56 yacht. If desired, this can be customised on demand with the name of the owner’s yacht to pair the sea and land offerings. Nice to look at but the price is for royalty and those previledged with special AP. The perodua fanboys will make-up their kelisa. Those cuppies will make do minis. What has happened to the local fiat dealer/distributors?? Next Post: Bugatti to reveal upgraded Chiron at Geneva show?